Moments of Mommyhood: Merry SITSmas! I am so happy to be part of the SITStahood! Merry Christmas to you all. I hope you have a very Blessed Holiday! Because I love you all so much, I wrote a little song for you. It's sung to the tune of "Jingle bells". for all us comment hogs. and now I have a chance to win some awesome giveaways. Oh, Jingle Bells SITS is Swell I just have to say. Oh what fun it is to meet a new SITSta everyday, Hey! Oh What fun it is to meet a new SITSta everyday! Now for a few of my favorite blogs I found through SITS! That's just a few of the great blogs I found. I plan to find a lot more. Happy Holidays! .........................Oh my, did I forget to mention that SITS is giving away a prize an hour today? That's right and the GRAND PRIZE is YOUR Blog Featured as the Friday Favorite and....A $200 Target Gift Card! Go check out all the fun at SITS. FABULOUS!!! you are soooooo CREATIVE!! You are so very talented!@!!! wow ! thats super cool ! very talented indeed ! Merry SITSmas to you, too! Love your jingle! Too cute! Great song!! You are SO creative! AWWW, how cool. You are so creative. Merry SITSmas to you, Sandy!! Everey is so creative today....Merry SITSmas to you too!!! Is there any way we could get a vlog of you singing that song to us? Hmmm? Shake it up a little momma! BTW! You're it on photo tag - it's not too bad! MERRRRRRY SITS-mas! Ho ho ho! Merry SITSmas! Thanks for stopping by! I enjoy your other blog! Very cute!!! Saying hello as another mom of "only" five! Happy SITSmas! Merry SITSmas to you! Love your song! Merry SITSMas! Great little jingle you got going on!!!!! Thanks for spreading the Joy at my blog and want to return the Season's Greetings. Beautiful family. Merry SITSmas to you, Sandy! I love that card! Snowmens are my favorite! Cute poem too. Merry SITSmas! What a cool post. Wishing you a Merry SITSmas indeed. GREAT blog design, pretty script and great music. Loved, loved, loved the song! Great jingle - thanks for stopping by today - love meeting new bloggin' buddies! You did a fantastic job with your song! Much better than my lame poem! Merry SITSmas! We have "only" four but the debate has ended here, LOL!!! Great pictures of the Five!! Love the poem. Merry SITSmas! Merry SITSmas and good luck today! very creative! have a blessed holiday! CUTE POEM, CUTE BLOG! MERRY SITSMAS! 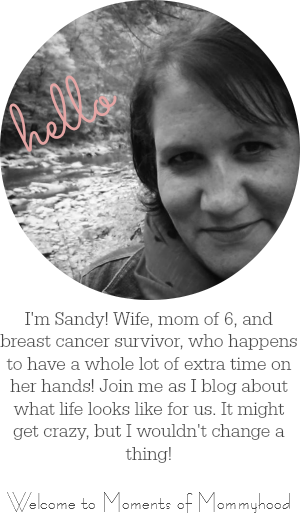 Awwwww Sandy, thanks for the bloggy love! You are honestly one of my bbfe's! (best bloggy friends ever!) Cheesy I know. Someone said that to me today so I've been dying to use it! I hope you have a fab Christmas. Oh and I love the new layout too! What a cute card! Merry SITSmas! And a very Merry SITSmas to you!! Thanks for visiting me and hope your family has a great holiday season! Great poem :) Merry SITSmas to you, and thanks for stopping by! WHAT FUN this is!! I'm so sorry now that I was late in the game! I am discovering so many nice blogs! What a great blog layout you have, so cute! Thanks for stopping by my blog, Merry SITSmas! Thanks for stopping by my blog. What a great blog you have. I'll be back. Merry SITsmas to you and your family! Merry SITSmas to you too. Thanks for stopping by. p.s. You have five and you want another one?? I feel like ripping my hair out sometimes with only one! You are one brave woman! Love the song! Have a Merry SITSmas! Hey thanks for coming by and leaving me Comment Love! Merry SITSmas! I like your song too! That was the perfect poem to explain it all! Merry SITSmas!